Woman Finds Needle In Her Son’s Reese’s Candy Bar. You might think twice about biting onto a candy bar once you hear this mothers story. With Halloween just around the corner, it’s also a reminder on checking your children’s candy before they eat it. A Kansas mother is terrified after buying her son a pumpkin Reese’s at a local grocery store that contained a needle inside. Luckily, she took the first bite, not her young son. “Luckily it didn’t stab me in the mouth. I caught it with my teeth,” said the mom Tamara Powell. “In the corner, you can see a little hole in it where it was pushed through. When the officer looked, he said it could be possibly be where it was pushed through,” Powell said. The family is not filing a lawsuit against the company, but they are making sure the batch of candy is removed from the store where it was purchased. “It is terrifying because it was in there. You don’t know what was on that needle. You don’t know how it got there. You don’t know nothing, and it’s been in your mouth,” Powell said. The police said if they find out who put the needle in the candy, they will file assault charges. They are currently reviewing the store surveillance cameras. This isn’t the first incident for Reese’s. 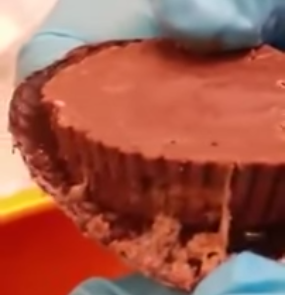 Earlier this year a girl found that her Reese’s was filled with maggots. A Man Was Hiking Through The Mountains And Found Something Absolutely Terrifying!